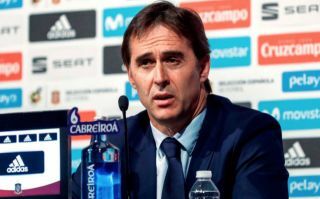 Real Madrid take on Espanyol on Saturday night and Julen Lopetegui’s squad for the encounter has been confirmed with Vinicius Jr getting the nod. Los Blancos dropped their first points of the season last time out away at Athletic Bilbao, but bounced back with a convincing win over Roma in the Champions League in midweek. They’ll be looking to pick up from where they left off against the Italian giants, with Espanyol hoping to put a further early dent in their La Liga title hopes at the Bernabeu as they won’t want to allow rivals Barcelona to build an early gap. Lopetegui has announced his squad for the clash, and there is one name that has seemingly got most of the attention from the supporters below, with Brazilian youngster Vinicius Jr securing a place in the 20-man group. The 18-year-old has been impressing for the Castilla side, scoring three goals in three games as he has continued to knock on the door to be involved with the senior squad while training with the players in midweek. It remains to be seen if Lopetegui gives him that opportunity to feature at some point as much will likely depend on how the game is playing out, but it’s fair to say that many Real Madrid fans are anxious to see him in action, as the tweets below would suggest. Yeeeess #Vinicius #HalaMadrid Give him the chance to show who he is, he can do it!! Glad to see @vini11Oficial back in the squad ? ?